Landscaped by Nature! Check out the value in terms of location, quality and price! 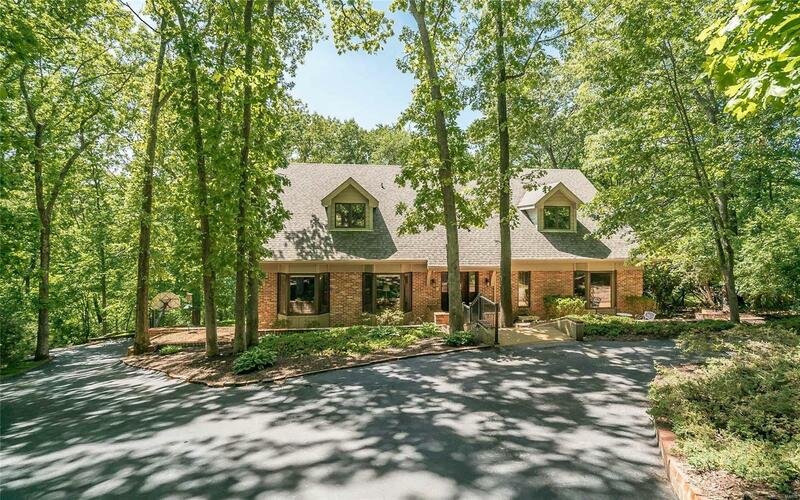 A dramatic 4BR/5.5 bath, brick & cedar 1.5 story, with 5100 fin SF is cradled in the most enchanting, sunlit forest clearing! Superior craftsmanship, soaring ceilings, expansive room sizes; a quality home for those who appreciate unique! The family chef will love the large, space-saving kit w/ wood flr, endless cabinet space, granite, butler pantry, pantry closet & many wndws w/tree-top views for culinary inspiration! Main flr Master Ste w/updated bath & 2nd BR suite on main flr; perfect for in-laws/overnight guests! Upstairs hosts 2 more enormous BR suites. (All BRs have baths & WIC). Fin walk-out LL is designed as a comfortable entertainment center! Workshop is a hidden bonus for hubby’s or hobbyists & could easily convert to 3rd car garage! NEW ROOF, composite deck, patio, fenced in yard, sprinkler sys,newer zoned HVAC. Yes, there’s a bit of a hill here, but it’s soooo worth it!